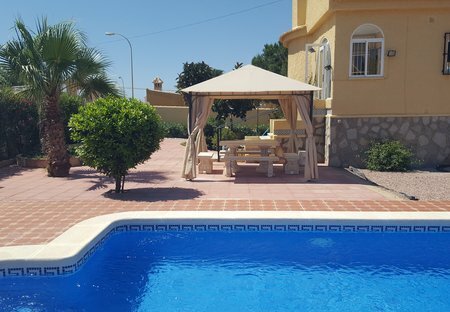 Rent villas and apartments in El Chaparral, Spain with private pools. Book affordable holiday rentals that are near a beach. This cosy townhouse with a shared pool is situated in a quiet residential area close to a nature park. A supermarket. This friendly apartment is located in the resort of La Siesta. The complex is located in the salt water lakes nature reserve and is close to all amenities. The apartment has a conservatory. This apartment on the 1st floor is located in the urban area of La Siesta, Miramar II, and is in a beautiful location near the protected natural salt lagoon. This nice apartment on the first floor is at the same level as a nature park. With the kind of bus facility from here, you can get to Torrevieja quickly. This tastefully furnished holiday apartment offers you a great terrace with comfortable sun loungers for sunbathing. This elegant apartment, which is on the 1st floor is located in a beautiful nature park. There is a convenient bus service to Torrevieja. This is an apartment located right at the nature park and it offers tranquillity and relaxation. A beautiful detached villa in the lovely urbanization of la siesta torrevieja The property consists 3 double bedrooms with 1 ensuite in the main bedroom.